Handcrafted Wooden Nativity Scene’s Statues from Val Gardena, available in three different styles: Comet, Ulrich and Saviour. 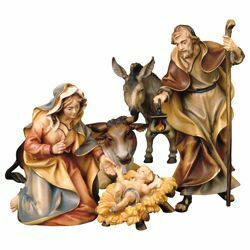 We offer wooden Nativity Sets and figurines made and entirely painted by hand and decorated with gold leaves by master craftsmen and woodcarvers from Ortisei (Italy). 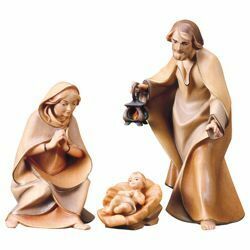 These statuettes are ideal for decoration and display in homes, churches, parishes and sacred places worldwide. Traditional Nativity Scenes, available in 9 sizes: cm 10 (3,9 in), cm 12 (4,7 in), cm 15 (5,9 in), cm 16 (6,3 in), cm 20 (7,9 in), cm 23 (9,1 in), cm 25 (9,8 in), cm 50 (19,7 in), cm 110 (43,3 in). Excellent quality/price ratio and Quality 100% Made in Italy. 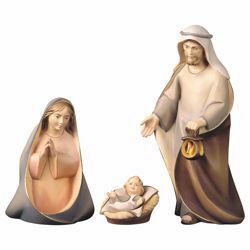 Holy Family 4 pieces - Statues in traditional Arabic style in maple wood. 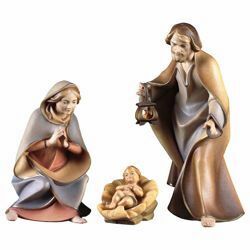 Holy Family 4 pieces - Statues in baroque style in maple wood. Italian nativity scene hand painted with oil colours and gilded with oxidized gold leaf by the master craftsmen of Val Gardena (Trentino Alto Adige, Italy). 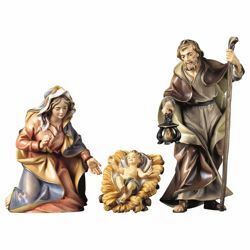 Holy Family 4 pieces - Statues in baroque style in lime wood. 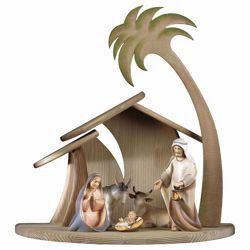 Comet Nativity Set 7 Pieces - Statues in traditional Arabic style in maple wood.